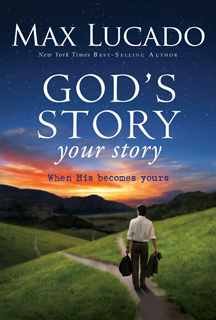 In Chapter Two of “GOD’S STORY, your story,” Max Lucado reminds us of how dangerous our true enemy is, whom we call “Satan”. Lucado gives us an overview of the great battle that occurred in the Judean desert so long ago between Jesus and Satan. Jesus is tempted to “look out for number one” (to turn stones into bread because He was hungry). Then Satan encourages Jesus to show off His great powers and impress the religious people by jumping off the Temple pinnacle and having thousands of angels swoop in and rescue Him. And finally, Satan tries to bribe Jesus by offering to Him all the riches of the world, if only Jesus would bow down and worship him. What Lucado does very well in this chapter, is to give us a clear of how devious Satan is, and how much we must remain on guard against all of his crafty schemes and strategies to tear us away from God. In fact, as Lucado points out, the root word for “devil” which is a character trait of Satan carries within it the idea of “splitter” or “divider”. And he will use any means possible to do just that, keep us divided and separated from God. This all reminds me of one of C. S. Lewis’ most famous best seller books called, “The Screwtape Letters.” In this book, the main character is Uncle Wormword, one of the senior demons of Satan, who (fictitiously) wrote letters to his much junior demon Screwtape, who happened to be his nephew. What is fascinating about Lewis’ book is that he suggests that some of the best strategies of Satan are not the all-out-frontal attacks that we might expect. But rather, Satan often succeeds the best if we end up being complacent about our spirituality and do nothing to pursue a relationship with God. But if Satan must step in, he will use such sly tactics as materialism, self-centered egos, or just plain old busyness of life. Distraction would work better. I hate spiritual focus. When you or one like you gazes intently on God for any length of time, you begin to act like Him. A nauseating sense of justice and virtue comes over you. You talk to God, not just once a week, but all the time. Intolerable. So I’d perch myself on every corner and stairwell of your world, clamouring for your attention. I’d flood you with e-mails and to-do lists. Entice you with shopping sprees and latest releases and newest styles. Burden you with deadlines and assignments. If I were the devil, I’d so distract you with possessions and problems that you’d never have time to read the Bible. I believe this last sentence of the quote above should be sounding an alarm for all of us who are believers in Christ. If we think that there is no time in our lives to read God’s word on a regular basis, then our lives are out of balance with what is truly important. Even worse, if any of us think we don’t need to be reading God’s Word as part of our daily and weekly lives, then Satan will find it that much more easy to bend us to his will, rather than God’s Word bending us to God’s will. These are only some of the names that are used to describe what Satan is like. I’m sure we can find much more in Scripture to tell us just exactly who our true spiritual enemy is. So what is the point of all this discussion? Namely this: if we are to really understand how the story of our lives fit into the bigger story of God’s life, then we need to also realize that while we are in this life, and this world, Satan too is a part of that picture. We should not be taken by surprise as much as we are when bad and terrible things happen. There is an author behind all this — Satan. What we need to do is to follow the example that Jesus gave to us when He faced off with Satan in the wilderness. We must be confident of who God is. We must continually be reading God’s Word and putting it into our hearts so that we have the spiritual tools to fight back against Satan. And we must trust that God can and will bring us through these times of spiritual wilderness experiences as well as the spiritual battles that come our way in life. An excellent preacher I know has said that research into spirituals habits show that reading the Bible up to three times a week shows little improvement in the overall wellbeing of a person (emotionally, spiritually, and otherwise). But those who read the Bible on average four times a week or more, have better marriages, families, church experiences, general health and success in business. So what are you waiting for. Get out your Bibles, turn to God, and resist Satan and his ways. He is the Enemy.